Pneumonia. It’s not uncommon, and I had it in 1978. I was 7. My Mom was allergic to penicillin, and fortunately I was not. I was diagnosed on the 3rd floor of the amazingly mid-century pediatrics clinic on Eastern Parkway in Louisville, KY. The funny thing with pneumonia is that, at 7, not only can you not spell it, but you don’t feel sick. I was directed to stay prone or, at the least, sitting for a full week. Mama picked up my first Fireside marvel boo for me to get me through. Every child of this era that had any kind of illness and still reads comics into the 20-teens has this story. It’s the tale of the thing they got when they were sick. What astonishing book am I holding out on? 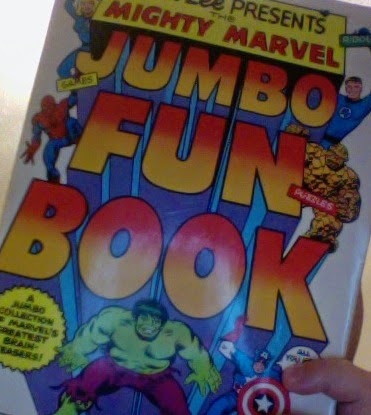 The most embarrassing comic of all: The Mighty Marvel Jumbo Fun Book. It’s not exactly a comic book.There are very few panels of sequential work. It’s not exactly a history, or an art book. however, there are several pages that work to demonstrate varied art styles and how they relate to commercial art’s portrayal of various characters. It’s not a how to book, but there are opportunities to learn basic drawing skills. It’s all that plus much, much more. Crosswords, trivia, word search, puns, mazes, word jumbles, and a lot of material that really is aimed at an adult collector of Marvel’s output. Considering that I was 7, and some of the material required an adult budget I’d say the book was appropriate for ages 7-47. Some of the more esoteric games include “Conan’s Monster Farm”. At 43, I have not read any more Conan that I read at 10, which is to say nearly none. Yet the child for whom this is intended is expected to be able to identify 7 monsters culled from the first 100 issues of the comic. A page with 14 word balloons where the goal is to ID the speaker? Beyond ‘Crom” and It’s Clobberin’ Time! !”there are few “gimmes” in this quiz. Still, I loved the book. For instance, it taught me that there were different artists drawing different comics. It game me a sense of history. I had only read 3 or 4 Hulk comics, but to discover that there were 6 artists that had drawn the character was fascinating. In 1978 I likely guessed 0 of them. Now? I got 5. Somehow, the book holds up. Some characters at the time were 100% new to me. Howard the Duck, Wolverine, and even Daredevil were unusual. Supporting characters like Professor Bong remained obscure until I was well into my 20s. I’m not sure when this book left me and moved on to another child. I suspect it was when my Mama was dating someone in 1980, and his son was getting into reading. I think a lot of the books from my younger years were passed on. So much of this book failed to make sense, but I still loved it. So, imagine my surprise when I found a copy for $12 last month. I had passed on copies ranging from $40-$125 on eBay recently. The alleys and avenues it opened up from my childish map of the world. It was pretty amazing. So much of this book was deeply ingrained. So many first encounters with different ideas, artists and characters. The puzzles undoubtedly worked to reinforce the memories. The Power Man Page? Why is Luke Cage such a favorite of mine, when I didn’t read a comic with him as the lead until 2001? Why is the SpiderMobile so iconic, when my first issue of Amazing was 2 years later? Checking it out now, there is also a lot that I enjoy now, that I was ignorant of then. Deathlok, Man-Thing, Tomb of Dracula. For the serious collectors, there are early appearances of Wolverine and Guardians of the Galaxy. It’s an incredibly campy, silly, infuriating book. Regardless, it got me through the sickest week of my young life. I still remember running in circles around the rom when Grandma wasn’t looking and Mama was at work. Could I tell the difference between the Ditko, Byrne, Romita, and Infantino Spider-Man? maybe. Can you?? That may be the best $12 you'll ever spend. I would have spent months with this book and never really understood the differences between the artists. Can you please explain to me exactly why Guardians of the Galaxy was chosen as The Next Big Thing for Marvel? I can think of dozens and dozens of more likely candidates. I hope it does well (and its neat to see Abnett and Lanning on IMDB), but it still makes me scratch my head.